LIVE PARTY and EVENT CARICATURE ENTERTAINMENT! Caricatures are a fun and unique experience for your guests at any event or gathering! Let Justin Galloway entertain your crowd with his hilarious likeness-oriented caricatures and his friendly and witty sense of humor. Justin has drawn thousands of happy people all across the country at corporate events, trade shows, colleges, weddings, bar/bat mitzvahs, birthday parties, grand openings, even at the Super Bowl! Whether your event is large or small, black tie or barbeque, Justin is sure to delight your guests with his remarkable caricatures. 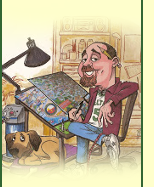 Justin Galloway’s services have been continually in high demand since 1994, and he is regarded as one of the most talented and professional caricature artists in the country. He enjoys a sterling reputation among event planning professionals and he has been hired repeatedly by numerous Fortune 500 companies and individuals alike. Justin accepts bookings year-round, so call or email today for a quote and to book him at your next event.